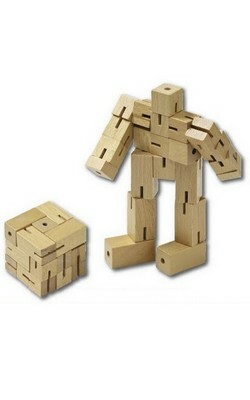 More than a promotional item, this Robo-cube Puzzle is a creative exercise that will delight adults of all ages. Our Robo-cube Puzzle is a wonderfully fun desk buddy for your home or work office. The wooden frame can be posed in several different positions and ends in it's resting position of the cube. Inspired by Japanese Shinto Kumiki puzzles, this interactive toy is a creative way to display your logo. The robot is made from genuine hardwood in a natural finish with strong elastic bands holding the segments together. Your logo will be displayed on each piece of this non-traditional toy robot for years to come.